Instead of fighting the ones who built and continuously feed the fire that is consuming us, we fight the flames which, in spite of our efforts, continue to spread, the flames rising ever higher. Those who built and feed the fire cover themselves by giving us straw-men to battle. In our puny attempt to extinguish the flames, we burn ourselves, frustrate and exhaust ourselves, all for nothing. Isn’t it time to put out the fire by raking aside the fakes in the showcase and exposing to the Bright Light those who plan our demise and the mysteries that have catapulted us into these, the Last Days? In the minds of deceived heathen, Zeus (Ormuzd/Allah) is made to appear as the Almighty God; the sungod, Apollo (Mithras/Ammon-Ra), as Jesus Christ. Beneath Israel, Lebanon, Syria, Jordan – in fact, all of the Middle East – is emptiness, emptiness in which are cities and people. All over the region are temples, shrines, obelisks, statuary. With many atop Mt. Hermon, where Zeus and his companions brought their spaceships down to Earth, some are in ruins, others are not. All were erected in honor of adored deities. Ever escalating, there is no way now of stopping the violence going on in the land that gave birth to the last two civilizations. In the old print above you see a Persian king sitting on his throne. Over him [sic] are three tiers of underground dwellers who are lending their support to the Persian leader of the surface. Christians aren’t the only ones being deceived. Mohammedanism’s actual gods are as pagan as the actual gods of those who manipulate the divided “Christianity” of Protestantism and Catholicism. There isn’t much time remaining; therefore, it is imperative that those who are able to grasp the truth of the Mysteries are given the opportunity to do so. It is, in essence, the difference between a future life filled with wonders and goodness and no life at all. The bottom line is terse and clear: All depends upon an individuals ability to recognize and gather truth; an individuals ability to handle Truth in the right way which, in part, means the responsibility of passing knowledge acquired along to others. Without religion, none of what is happening today could happen. Religion, in its many and varied forms, was structured for one purpose only: Deceit, deceit to render the peoples insensitive to their own common sense; deceit to render those with depth to their souls responsive to whatever they are told by their religious leaders; deceit for the purpose of using humankind to cause incidents that lead to death and destruction; deceit that leads to a chasm, a trap so deep and black that only a few clear-headed ones will be able to pierce the darkness, scale the jagged walls and emerge into the light of day. Worship of different celestials falsely believed to have devised the blueprint for Creation has existed on and beneath the surface of this planet since the time man first acquired the ability to think with some clarity and reason. The awareness of the presence of an invisible and superior force directing the affairs of mankind has been particularly acute among the more primitive of homo sapiens. The main reason for this clairvoyance has been the fact that the deeper a person’s skin coloring the less likely is that person to be “progressive and advanced,” and, therefore, less amenable to suggestions via thought manipulation. Progress and civilized living are largely the work of the highly intelligent and abominably stupid white man. . . Not only is it by our genes that we bring upon us our woes, but to a large extent we are responsible for those afflicting other races as well. By the very gifts that make us great, we bring harm and defeat to ourselves and the others who, with genes less refined are able to grasp the simple truths that somehow elude our sophisticated views. So short has been our sight that only a few hundred years ago, those who were able to grasp the truth of our invisible overseers were burned at the stake! Alas, we know to create, but we know not to perceive. . .
Because of the desire for an ever bigger role in the affairs of the Cosmic community, super-beings who, misjudging themselves, believed their power equal to the Great Spirit who created their spirits out of His own, put on flesh for the purpose of coming to Earth. These super-scientists, who are antagonists, work together as they pull the planet asunder in a war for full control. Whoever possesses Earth with its strategic position within the Zodiac circle will have command of a system of planets spread out ideally for launching attacks on similar worlds with similar light and life giving suns. It is a fact that we are in the midst of a very peculiar, a bizarre death-dealing situation that will reach out to include all of the world. Willfully, the more powerful of the leaders of the nations are doing what is necessary to bring about Armageddon. It is peculiar because of the Jews, who are in the midst of it all. Jewry accepts only the Pentateuch – the first five books of the Bible – as authentic. They can, as any race of people can if they take the notion, wrap themselves in these five books – Genesis, Exodus, Leviticus, Numbers and Deuteronomy, and make themselves out to be the people of the Spirit they refer to as G-d. Because the prophets of The Old Testament plainly state that it will be the Gentiles who will inherit Zion, they prefer to believe that only the first part of the Book is genuine. The New Testament, of course, is something that Jewry refuses to acknowledge at all. And that is understandable considering the way Jesus Christ unabashedly pointed them out as the children – descendants – of Satan. It is incredible that any promulgator of religion, whether Christian, Islamic or Buddhist, to name the more prominent, can fail to observe that Jews are not what they say they are, and that by allowing Jewry to have its way with them, they are calling the shots not only in the matter of death to billions of innocent peoples, but for their own miserable selves as well. Still, it should be remembered that religion – and not only the Christian – is not what it pretends to be. Since the time the Canaanites (so-called Jews) were run out of the Holy Land by the Israelites (pure Aryans), they have fumed with rage and determination: Canaan would be restored to them, and by none other than the descendants of the very ones who had wrested it from them millennia ago – a victory made possible by the Great One who had guided the twelve tribes to conquests which had culminated in the possession of land the center of which is the most magnetized on the face of the globe: Jerusalem! Because Jews are the offspring of the alien we know as Satan, they can hardly be the children of the one True God. . . A reversal of the truth was essential. The world would be made to believe that they – the Canaanites – were the Chosen. This could be done only through the persuasion of money, money in the amount that would be immeasurable. But you know the story of the Jews and the plateau that was reached when, world wide, the nations became dependent upon them for their money supply. In that regard, the evil of the Jews cannot compare with that of the detestable gentiles who sold out America and their own kind by illegally granting Jewry the privilege of installing the Federal Reserve System. With no other year as infamous, besides becoming the year when borrowers began forfeiting the real wealth they had accumulated in order to pay the interest on money created in a checkbook, 1913 also saw the start of the Income Tax, an illegal enforcement which seizes money earned by a worker before he or she has the chance to lay a hand on it. . . And it was also the year which, because of the Federal Reserve and the Income Tax, made possible the fratricidal bloodshed of World War I. . . No wonder the number 13 connotes evil! But none of this could have happened had it not been for that poison which saturating this civilization swings the bell in the church steeple, tolling out death and destruction: Religion! The Islamic Faith is a religious force which, in the Mideast, is fast bringing on the war that will spread and consume the world. The naked fact is that in the matter of deceit and duplicity, Mohammedanism rivals Christianity, which figures since both religions serve squarely the same purpose: that of making followers acquiescent to the overtures of popes, priests, and plain preachers. With a doctrine similar in many respects to that of Christianity, a startling parallel exists between the origins of Mohammedanism and Mormonism. The “revelations” given Mohammed by the Angel Gabriel and those given Joseph Smith by the Angel Moroni correspond so closely that it is no wonder that, upon study, a whole field of suspicion is opened for investigation. Out of the first came the Koran; out of the second the Book of Mormon. While the number of Muslims in the world far outnumber Mormons, the power of the latter is huge, more than anyone would suspect, I mean clandestinely, in the field of politics. According to both “prophets,” the Revelations were received in a most spectacular way. Mohammed, who preceded Smith in life by some 1,250 years, claimed the first of his were written in golden rays on a gigantic tablet in heaven, while Smith declared his came via gold plates which, found in a hill to which he was mysteriously directed, were covered with Egyptian hieroglyphics. Seeking solitude for meditation, both men gave Abraham billing right at the top. Containing a moral as well as a religious code, the Koran, which is about the size of the New Testament, regulates all civil, legal and military transactions. The leading doctrine of the book is the “Oneness of God,” laid down is the symbol of the Moslem, “God is God, and Mohammed his prophet.” It teaches that no gods except God exists; that the one God is the “Lord and Light of heaven and earth.” Which opens up a can of worms. Like with Smith which god did the “prophet” have in mind? After all, “the Light of heaven and earth” is the sun, the lord of which is the sungod. In chapter 11 of the Koran it is stated, “We make no difference between that which God has taught us and that taught by Abraham, Isaac, Ishmael, the Twelve Tribes, Moses and Jesus.” Considered no more than a mere mortal by the Prophet, Christ is placed in the category of the prophets Adam, Noah, Abraham, Moses and Mohammed, all of whom, including himself, of course, he assigned a place in the seventh or highest heaven, “in the immediate presence of God.” Idolatry, and the deification of created things are severely condemned. The Koran prescribes prayer five times a day, with the face turned toward Mecca (as long as Mecca is East – ed). Borrowing freely from other religious doctrines and customs, turning the face during prayer toward a certain point is common with the Orientals. Particularly so with the Jews, Sabeans, and Magians, the point to which they turn is called Kebla. In the beginning, Mohammed adopted with the Jews, Jerusalem as Islam’s Kebla, but later changed the Kebla to Mecca. Fasting, giving alms, and a pilgrimage to Mecca and Mount Arafat are prescribed. . . (similar duties were common among Oriental sects long before Mohammed hopped aboard the religious bandwagon – ed) Probably the most stressed of Koran doctrine is “the merits of death” in the cause of religion. In view of the role Moslems are playing in the bloody drama now going on in the Mideast, this last is something to keep in mind. The Koran is divided into 114 chapters, each of which begins with the phrase “In the name of God.” Many of the chapters have mysterious inscriptions, such as “Congealed Blood,” “The Fig,” “The Star;” “The Towers.”. . . Strange, unless one is able to pierce the mysteries of the bible of the Moslems. The sungod of the ancient Persians (today’s Iranians), is shown here as having come out best in a battle with a white bull. A symbol of Zeus, the bull has also been attacked by a dog, a serpent, and a scorpion, all of which represent Satan whose dwelling is in the underworld of the Mideast. These two, Zeus, the skygod and Mithras (Apollo), the sungod, are constantly at war with each other. Using unaware surface dwellers as their tools, the purpose of the warfare is to eventually bring down a civilization turned rotten and sour and to kill off an unwieldy, over-productive, crime-ridden population. Once disposed of and the slate wiped clean, the Phoenix will arise from out of the ashes, after which a new civilization will begin to replace the old. Over all will be the aura of innocence, of tremendous vitality, of purpose and urgency – a will to accomplish great feats scientifically and industrially. This Ammon-Ra of the ancient Egyptians, this Bel-Merodoth of the ancient Babylonians, this Mithras of the ancient Persians, has been the actual head of the Catholic Church since the time of its beginning. Supposedly made up of the utterings of Gabriel during the course of the Angel’s supposedly long communication with Mohammed, the original Koran was supposedly written on parchment made of the skin of the ram which Abraham sacrificed in the place of his son, Isaac. The volume supposedly, was ornamented with precious stones, gold and silver which came. . . from out of paradise! The divinity and authority of the Koran were contested as early as 740 A.D. But this heresy was checked by the execution of its author. Again, about 70 years later, it reappeared; but was again subdued. This time by Hyrum II, who in 842 prohibited the nature of the Koran to be discussed. That once the Koran did not receive its present day adoration and obedience was evidenced by men who regarded the “Prophet” as a man possessed, and earlier passages of his book as no more than wild, unbridled flights of fancy. What you read here regarding the Faith of Islam is not something I thought up for the sake of sensationalism. . . It is the result of research. This research was done in my own small library via reference books which date back to the first years of this century. With most of the encyclopedia predating the first world war by some ten years, I feel fortunate in having these volumes. . . because, much of that which they contain does not appear in reference books of later date. First, I want to make it clear that my sympathy has always been with the Palestinians. In their fight against Zionism, it goes without saying that I am on the side of the Moslems. Calling her that “Great Satan,” I can well understand their hatred of the United States, for if my country would turn its back on Zionists instead of giving them everything they ask for, the situation in the Middle East would begin to correct itself. When administered by an individual with the proper magnetism, the promptings of a priest can inflame; reason becomes unreasonable, and fanaticism takes control of the mind. Realizing that, I am aware that what is written in this booklet is asking for trouble – trouble far more likely than any I might receive from Jews, who are of an entirely different temperament. Still, I can not, and should not ignore the truth of other religions anymore than that of the Christian …. for it is only through the revelation of the secrets of religion that there can be hope for the continuation of any race of people. The picture above shows the Mecca Gates at Jetta, near the Red Sea. Through these gates go pilgrims bound for the birthplace of Mohammed (note the sungod symbol – rays of the rising sun – on the upper part of the gate to the left). The principal objects of interest in Mecca are the Mosque and the stone building called The Kaaba. A small oratory, the Kaaba contains a black stone said to have been given to Abraham by an angel on the occasion of the building of the original Kaaba. The walls of the Kaaba are of gray Mecca stone. Large blocks of different sizes, the stones are roughly joined together (the fact that the stones are of different sizes is very significant; also that they are roughly joined together. When dealing with stones with properties essential for transmitting and receiving sound to and from outer space, they must be used in different formations, must not be uniform in size, and must not be touched by a tool). Kissed by millions of visiting devotees, over the Kaaba is draped a curtain of rich black silk. 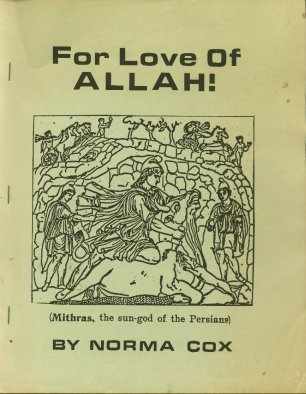 Understanding why, as the twentieth century moves into the final years, certain facts of a “delicate nature” would be omitted from later editions of encyclopedia, I was elated with the freedom of the old books, one of which states that “tradition has it that Mohammed was assisted in drawing up the Koran by a Persian Jew, one Rabbi Warada Ibu Newsal.”. . . and also a Nestorian monk. The interesting thing about the latter, in relation to the Koran, is that Nestorianism taught that there were two persons as well as two natures to Jesus Christ, and that the Virgin Mary was in no sense Theotokos, or Mother of God, as she was the mother of the man Jesus and not of the Word. The intriguing angle to the Nestorian’s part in writing the Koran – if such were the case – is that he was abbot of the convent of Addol Kaisl, which was in Bosra in Syria. Now Bosra (Bosrah) is the place of Mount Hermon, the mount upon which Zeus and his companions descended for the purpose of laying with the daughters of men. However, I have no way of knowing if the locale had anything to do with the beliefs of the Monk, though, considering the circumstance, it is not presumptuous to say that it probably did. As to what else he might have contributed to the writing of the Koran, there seems to have been little other than the down-grading of Jesus Christ. However, the account does go on to say that “since 1533, a portion of the Nestorians have been in communion with Rome, and are known as Chaldeans.” This bit of information is pertinent in light of the fact that the Chaldeans (Babylonians) worshipped as their first deity the sungod and his companion, the moon-goddess. In this they have much in common with the Vatican which has the sungod disguised as Jesus Christ and the moon-goddess as the Virgin Mary. . . Only the names have been changed, the better to fool the blinded masses. As for the Persian Jew rabbi, his contribution to the Koran – if such were the case – appears to have been quite extensive. If what the old book states is true, the influence of the Jew rabbi on the budding religionist must have been little short of complete, for in the Koran the only books used of the Bible are the first five, plus Psalms. The only books acknowledged by Jews as authentic, the interesting thing about these books is that they can be used not only to favor Jews, but any other race of people as well! As for inheriting the Earth, no doubt this is one of the incentives that fires Muslims into acts of reckless courage, as is happening now in Gaza and the West Bank. . . a spectacular backed by leftwing Jews 100 percent. Significant – and understandable, if the book is right and a Jew really was in on the writing of the Koran – is the fact that the works of the New Testament, which is solely the book of Jesus Christ, is left out entirely. . . Considering, one cannot help but wonder if perhaps the Jew was thinking far into the future, to the time when the Koran could be used for the benefit of his people. But not only was Mohammed acquainted with the religious systems of Jews and Christians (by that time Christianity was well under the thumb of the divided Jews who, during the time of Christ, were known as Pharisees and Sadducees), but also with the pagan religions of the Sabeans and Magis. Drawing upon these latter for material, the idea was to create a religious umbrella, one with a doctrine broad enough to accommodate without friction religionists of all kind, most of whom – then as now – were pagan. This leaves the reader with the impression that Mohammed was perhaps a fabricator who had no trouble dreaming up a “huge tablet in heaven with writing spun out in threads of gold.”. . . . wonders performed for his benefit only by that mightiest of God’s angels, Gabriel! At any rate, the account then goes on to state that Mohammed married “a rich and noble widow” named Khadija; that the following 15 years of his life were passed in domestic tranquility, interrupted only by occasional retirement into the solitude of the mountains. From his youth the future prophet had shown a fondness of seclusion and serious meditation. When 40 years of age, Mohammed declared himself an apostle and proclaimed the doctrine of Islam. With his slogan, “There is no God but Allah, and Mohammed is his prophet,” he made public his doctrine, insisted on the unity of God, and denounced all kinds of idolatry. But for years his following remained small. During that time opposition to him by the elders and people of Mecca grew, becoming bitter and violent. As a result, some of his disciples deserted him, retiring into Ethiopia. In A.D. 621, Mohammed lost his faithful wife. The death of Abu Taleb took place at about the same time. During the time that Mohammed was suffering from his loss, the Koreishites, who had decided that they had had enough of the prophet, resolved to put him to death. . . The problems Mohammed encountered appear to have been the same kind that the “Prophet” Joseph Smith ran into some twelve hundred years later when he tried to eat his cake and have it too. The above illo is intriguing. The home of the Giants was the underworld of the Mideast. The lower legs of this giant are snakes, indicating an oversized descendant of Satan who, more than any other pagan deity is symbolized by the snake. The picture shows the giant to be under attack. The attacker is Artemis (Diana), the queen of the queen of heaven, the Moon. A battle between the giants of Earth and beings living inside the Moon is being fought with missiles (note bow, from which the arrow – missiles – are being launched). The attack, however, is coming from another quarter as well. This is indicated by the Ram (Mars) whose teeth are sunk into the giant’s leg. At any rate, Mohammed fled Mecca and hid in a cave. There he remained for three days. Then, for some unexplained reason, a complete reversal took place. From a populace wanting to be permanently rid of the man who obviously was hell-bent on establishing beliefs contrary to the ones held sacred down the line of forebears, Mohammed became an adored person. Something happened; quite possibly, something was made to happen. Whatever, overnight, it seems, the “Prophet” became a celebrity, a “divine” figure. His every word electric and received with unstinted assent, immediately, he turned into a sort of demigod. Not letting the grass grow beneath his feet; Mohammed lost no time in taking advantage of the situation. Along about July 16, 622, he decided to make a grand entry into Yatreh. There, “amid the loudest welcome of the citizens” he took it upon himself to appoint himself to the offices of King and Priest! Thereafter the Prophet, feeling sure of himself, engaged in warfare. In shedding blood abundantly, he was able by force to establish the Faith of Islam over a large portion of the world. To learn the full truth of Mohammed and the massive, tortuous religion he engineered, parlaying it into a power with a force of millions of fanatics ready and willing to kill and be killed for love of Allah and an early entry of their souls into that place called Paradise, would be more than interesting, it would in fact be dynamite with which to blow the present bloody situation in the Mideast into another course of action. If there is one thing that I am now certain of it is that Mohammedanism was, and is, the work of intriguers, of sorcerers and astrologers – possessors of the secrets of Earth and the solar system. . . Secrets orally imparted down through the millennia, the centuries; secrets known only to those few who were and are able to make contact with the Gods, both within Earth and the Universe. With the Mideast the preserve of Mohammedanism, in the map of that area shown above, the old land of Mesopotamia is singled out. Straddling the Euphrates and Tigris rivers, the surface of this land, now Iraq, covers a main portion of the underground world of the alien we call Satan. Long a part of the very ancient Babylonian dominion, the Romans obtained possession of Mesopotamia in A.D. 165. Surrendered to the Persians in 363, the Carmathians overran it in 902. Between 1514-1516, the turbulent region, now embroiled in a life and death struggle with Iran, was conquered by the Turks. It was still in Turkish hands when British forces invaded the Near East during World War I (this last is important to keep in mind as Germany and Turkey were aligned during the first world war (more of this later). The history of the Arab people before the time of Mohammed is obscure. The earliest inhabitants are believed to have been of the Semitic race. Jews (Canaanites) who migrated into Arabia in great numbers after the destruction of Jerusalem appear to have been on a mission: that of making proselytes of the natives, to influence their thinking in a way that would favor the introduction of a religious doctrine such as the Koran . . . . A plan that would unite Arabs and induce them to accept and extend a creed which would not be a traumatic change from that which they found agreeable. . . A set of do and don’t laws corresponded loosely to that of the Judaized Pentateuch, plus the mysteries of the diabolic cabala, which had its beginning in Chaldea (Babylonia). The above information, much of which was gleaned from the 1912 reference books, indicates that Jews were preparing Arabs to accept the eventual appearance of a man who, with tremendous magnetism; could get away with proclaiming himself a mighty prophet of the Almighty God. Proclaiming himself the recipient – via the trance state – of messages sent him by the Lord through an ambassador – an angel of the highest order, a man whose image and doctrine would grow stronger with the passage of hundreds of years; a man whose image and doctrine, through a succession of diabolic Priests, would cause the followers of the religion to turn into fanatics amenable to destructive suggestions and commands. The Sabeans, who appear to have been somewhat above-board in relation to the Mysteries, worshipped angels, or super-intelligences (we call them gods, extraterrestrials, aliens, etc. ), and the stars. The Sabeans believed (correctly) that the super-beings they adored resided INSIDE the stars (while we are made to believe that planets are solid bodies and that all stars are suns, which simply is not true) Far outnumbering suns are planets which appear as suns because of the light of the small suns within their hollow interiors. The characters and plot are the same; but to better fool the masses, the names are changed and the plot disguised with different props. The above photo shows a bronze figure of the Hindu god, Siva (Satan). Siva is the third god of the Hindu Triad. The other two are Brahma (skygod Zeus) and Vishnu (sungod Apollo). In India, and all over the world, are worshippers of Siva. Not only do they regard him as the chief deity but the deity comprising all deities. Beyond doubt, this concept has penetrated religions to the extent that this god of the underworld is confused with the sungod. Representing the characters of both Destroyer and Reproducer, to his worshippers, Siva is cast in the role of the phoenix the part usually assigned to Apollo. In the picture, he is shown within a circle fringed with what can be regarded as flames (World in flames). In constant conflict with the good god, Brahma, Siva’s weapons include the bow (missile launcher) and thunderbolt (missiles). Of the trio of gods, this one – the one we call Satan – is beyond doubt the most powerful and dangerous. Streaming forth from the openings at the poles, the light (aurora borealis) of these inner suns twinkles because of the movements of the planets. Sabeanism was probably the most influential of all ancient pagan religions which, when boiled down, all amount to the same thing: the worship of extraterrestrials of other worlds, and worship of extraterrestrials of this world, particularly Zeus, Apollo, and Satan, all three of whom are known by a wide assortment of names. This worship was, and is engendered by the evil keepers of the mysteries and the Systems who believe that worship is due the super-beings; that worship is the catalyst which provides the means of fulfilling the demands of the so-called gods. The Magi were sorcerers and astrologers. After the rise of Zoroaster, they became the priests of the Zoroastrian religion. Givers of amens, interpreters of dreams, workers of enchantments, the work “magic” originally meant the work of the Magi. The Wise-men of the East who brought gifts to the new-born Jesus are said to have been Magi. But perhaps they weren’t; perhaps to say they were is only a ploy to clothe the evil priests with respectability. Wise to the potential hidden within the elements of Nature, they know of the places where certain of these elements converge and form a base of power which, with proper arrangement and manipulation, allows contact, visual and audible with hidden beings near and far out in the universe. Devised by evil humans – quite often gurus who claim to have great wisdom through contact with super-natural beings – for the purpose of advancing the plans of super-beings, the religions of which I write are actually secret societies viciously and literally embracing billions of blinded unknowing peoples. With the possible exception of Zoroastrianism which, reportedly, was pure at the time of conception, I know of only one other flawless faith. Tragically, the purity of that one faultless hope for white humanity quickly dimmed when, upon infiltration of corrupters, an infusion of leniency, of perverse viewpoints and-actions were permitted to enter and bend and twist beliefs that had been faultless. . . . In my opinion there is today no where a religion as deliberately misleading and dishonest as Christianity. While Christianity is the more deadly because it renders useless the unmatched qualities which, of the white Gentile-Aryan, could, were they unbound, reverse the horrendous situations bringing down the world of today, conversely, Mohammedanism removes the leash and fires the old tendencies of Arabs to seek bloody revenge on any people their priests tell them is the enemy of Allah. . .
All for the love of Allah! But who, exactly, is Allah? Is he the imponderable Spirit that came down upon Mt. Sinai to give to Moses laws and rules to guide and safeguard the welfare of the Aryan people? Or is he the god, Mithras, of the earlier Persians; or is he the Ormuzd of the Hindus, who, supposedly the opposite of the Hindu, Siva, resides in Agharti, that Shangrila within Earth? Evil prevails over good, and for this reason Paganism has prevailed on and within this planet since the time the survivors of the Flood picked up the pieces and began to build anew. Sending certain of the underground dwellers out upon the surface, their job, and the job of their descendants would be to take the raw and the primitive and slowly transform it into cities glittering with prosperity. . . A world of cities which, upon reaching a peak, would begin to show cracks, and to crumble beneath the weight of a deliberately over-charged, over-activated society. Because it beams upon Earth the light and heat without which life on the surface cannot exist, the sun and the deity riding aboard what appears to be a great ball of fire have been chief objects of adoration for endless millennia. Of the three chief male deities, the sungod, whom the ancient Persians called Mithras, appears to have been more an object of worship than the skygod, whom the early Aryans of Persia called Ormuzd. Perhaps because Persians have never exhibited a great deal of deference for women, it should not be surprising that the moon-goddess, so prominent in the pantheon of gods and goddess’s of other pagan religions, appears to have played no part in the ancient – and the present day religious system of Islam. So close is the similarity between the ancient Egyptian’s Osiris and Ammon-Ra and Zoroaster’s Ormuzd and Mithras and Hinduism’s Brahma and Vishnu that to doubt they are identical would be foolish. An odd thing is that 1200 years separated the births of Zoroaster and Mohammed, while Joseph Smith put in an appearance some 1200 years after the founder of the Islamic faith. Perhaps not coincidental at all is that all three prophets claimed to have received their revelations in the same manner, Divinely, from an angel in heaven. Of the three, Zoroaster was perhaps more of a showman. His actual name Spitama, the assumed name of Zoroaster implies a connection with the Zodiac and Cosmos, indicating the religionist had an unusual flare for the sensational. According to legend, Zoroaster spent fifteen years preparing for his work. During that time, it was said that he was tempted by the evil spirit, Ahriman (Satan), “but came off conqueror.” But probably the whole thing was no more than a stunt – an attempt to equate the budding prophet with Jesus Christ, who also successfully resisted the temptations of Satan. It has been alleged that at first the doctrine of Zoroastrianism was a pure monotheism; that taught was the existence of but one divinity, that of the Ahura-Mazdao (Ormuzd), who was presented as the creator of all living things. However, if Monotheism was ever a part of Zoroaster’s scheme for a dominating religious system, it did not remain so for long, for there soon came from out of the one Holy One two: Good and Evil – God and the Devil, or Satan. As was bound to happen, soon a third principle, or deity, crept into the picture. This one took the position of mediator between the two opposites, and also as administrator of the system, which means that he was given full power over all things political. To this third divinity was given undivided adoration. Calling him Mithras, he was, of course, the sungod whom the Chaldeans called Shamash – an abomination to the one true God. The doctrine of Zoroastrianism was/is contained in the Zend Avesta, which is a lot different now from what it was in the beginning. The liver was, and is used by diviners to prophesy and conjure up future events. Inscribed with magical formulas, the clay model of the liver in the picture above is from Megiddo. Situated between Gaza and Damascus, in early biblical times, Megiddo was a city of the Canaanites. Interesting is the fact that it is in this general area that today Palestinian children fight with sticks and stones Israeli soldiers who, thinking of themselves as Jews, are actually Canaanites. A place of terrible conflict and grief, an Egyptian king once said that to capture Megiddo was to capture a thousand towns. Puzzling? Not if you know that within the caverns of the hills and mountains of the area are countless towns or cities, descending into earth, one layer upon another. “And Manasseh had in Issachar and in Asher Bethshean and her towns, and Ibleam and her towns, and the inhabitants of Dor and her towns, and the inhabitants of Endor and her towns, and the inhabitants of Taanach and her towns, and the inhabitants of Megiddo (underground) . . . Throughout ancient Irania, Upper Tibet, Sogdiana (Uzbek, a Soviet State in central Asia, mostly Moslem), Bachtriana, Media, Persia, etc., the Zoroastrian creed flourished. But upon the death of the great conqueror, Alexander, it began to lose ground, and under Alexander’s successors became much depressed. . . . But all of that changed upon the advent of the Sassanian dynasty of kings (A.D. 235-651). During the time of its suppression, the bible of Zoroastrianism largely became forgotten, and by the neglect part of it became lost. But the new overlords had a remedy for that: The Magian sages. The sacred volumes were translated out of the original Zend into the vernacular dialect of Persia, after which they were disseminated among the people at large. While the fanaticism of the Magis found vent against Christians and Jews (by that time Christianity had become well-drenched in the Judaism of rightwing Jews), in return the Magi were cordially hated by the Canaanites. . . But, it was frequently found that Jewish sages were not only friends with some Sassanian kings, but were their confidants as well. The religion of the fire-worshipping Zoroastrians flourished uninterrupted for about 400 years. But that changed in A.D. 651, when at the great battle of Nahavand, the Persian army was routed by the caliph Omar. After that, the great mass of the population was converted by fierce persuasion to the Mohammedan faith. Those who resisted and continued as Zoroastrians received the name of Ghebers, or infidels, and were subjected to severe oppression and persecution. As a result, many of them emigrated to India where they became known as Parsees. . . The Fire Worshippers of Persia! Merchant princes and owners of vast amounts of land, the worship of these Parsees became intermingled with the practices of the Hindu religion. Recognized is one god, Ormuzd. According to the Parsees, the sun that is in the eye of Ormuzd (skygod) is the sungod, Mithra. The defeat of Persian armies by those of caliph Omar brought an end to the Sassanide dynasty. The last king was Yezdegird. Beyond doubt this king was a greatly admired fire-worshipper, because after his fall there emerged a religious sect of fire worshippers calling themselves Yezidis. Possibly to be as close as possible to the “Prince of Darkness,” the Yezedis settled in Kurdistan, beneath which is a center of Satan activity. In the “Black Book” of the Yezidis, Shaitan commands: “Speak not my name nor mention my attributes, lest ye be guilty, for ye have no true knowledge thereof, but honour my symbol and image (from the W.B. Seabrook book, “Adventures in Arabia,” here again we run into a situation where the god of the infernal region and the god of the sun – also called Helios – ware confused). What can be learned of the all-important matter of the Gods is mixed up, and to give a strictly individualized picture of the triad of gods, Zeus, Apollo, Satan, is an impossibility. There are Jews who can rightfully claim kinship with Abraham and David. More powerful than the others, these are descended from Red Esau. The twin of Jacob, these brothers were the sons of Isaac, the son of Abraham. But while the Almighty God loved Jacob, He abhorred Esau. Nonetheless, because he was of Abraham, the Creator awarded to Esau the land of Edom (Red Edom, now a part of Saudi Arabia). Going into the cities, or towns, within the mountains of Edom, Esau, who was obstinate and cruel, disobeyed his parents and took to wife heathen women. Chief among them were ones from Canaanite tribes. Worldwide tax collectors and worldwide drug-dealers, the more powerful of the descendants of Esau and Canaanite women reside in Bombay, India. Responsible for the opium that devastated China early in this century, from a place of security these Jews direct drug trafficking around the world. The “Princes of Captivity and Kings of the Jews worldwide,” they live and plot without fear of detection. How can they do that? Easy – straw men take the heat for them! Responsible for much of the religious beliefs (it is my understanding that the worldwide “Council of Churches” is in their pocket, and that from that putrid organization they receive even more money than that which is provided by the worldwide sale of drugs!) they decide what is to be taught in schools, the kind of reading we can have, and the kind of entertainment: TV, movies, music, dancing, you name it. Like their forebear, Esau, they are sun/fire/phallic worshippers. . . They are Parsees, spin-offs of Zoroastrianism! Because they are headquartered in Bombay, and because the chief among these Jews are called Sassoon, it is not unreasonable to wonder if their name wasn’t purloined from the pagan Sasonades who once ruled Persia. . . and if their ancestors were not among the fire/phallic worshippers who, retreating before Mohammedanism, departed ancient Persia to take up residence – and become filthy rich – in India, mainly Bombay. A confusion of deities seems not to have mattered to the ancients who, regarding them as essential to their well-being, adored them not only because of their feats of “magic,” but because they felt that for their personal safety, adoring them was the wise thing to do. Throughout the Bible the people of God are warned against these super-beings who, waging war through them, use Earth as the base to carry out expeditions to other worlds, and conquests of worlds within the system and beyond the Seventh Heaven. It seems the religionists of olden times ignored the omnipotent God because they thought Him too far away to matter, to care about what happened to them. After all, the nearby gods were the ones controlling the planet, seeing to its safe passage into space, its revolutions, its seasons, its weather. Of the bibles of the different religions, I know of only one that exposes the truth of the Inner-earth, the truth of life on, or within other planets, the truth of the Fallen Watchers who do indeed control our planet and all that happens on and within it. . . The truth of it all is contained therein – but, alas, the wording is too mysteriously couched for ordinary understanding. But if it were understood, we would know that we are a long way from being forgotten by the Great One who came down upon Mt. Sinai because of His concern for us. And today, more than ever, we are watched by His celestials; we are being graded, our will to understand, our behavior, our willingness to extend ourselves for the sake of others. It is worth the effort not only for the sake of survival but for the test of our metal as well. Whether we like it or not; whether we agree with it or not, it is the system. Personally, I see and understand the wisdom of it. A false religion cannot survive its corruption; and when it becomes so rotten that it loses its usefulness to those who forged it, a dynamic new “Prophet” is found, one who can bring in a new religion to replace the old. Manipulated by evil men – wicked priests – the same old erratic gods and goddess are put on the same old pedestals. All that is changed are the names and locations. It is difficult for the everyday kind of person to visualize a world in which the fate of the nation is decided by the divinations of sorcerer/astrologer priests. Therefore, one should not fault the everyday kind of person’s unwillingness to accept such an indictment. Yet, as bizarre as it seems, it is fact and has been going on for thousands of years. Leaders of nations didn’t get that way because they are wise, just, and competent. They were given power because they became a part of an incredible system. Somewhere along the line, leaders, whether emperors, kings, dictators or elected by the common people, were given power, or the chance to seize power, because they fit perfectly into the mold that advances the desires of beings not indigenous to this planet. Not often, but occasionally such a one will be great in his own right. Such was the case with Adolf Hitler who beyond doubt had contact with super intelligences not of our orb . . . . (of which more later – an absolutely fascinating situation that instead of fading into the tragedy of the death and horror of nearly fifty years ago, refuses to go away). Somewhere along the line, men who achieved tremendous power did so because they had a desire to pry into the Mysteries, not for the purpose of perhaps helping mankind to better understand the truth of his existence, but for personal satisfaction, and the expectation of a great deal of excitement. So, they join a lodge, an order, a society of a kind that promises to open doors leading to a world beyond the mundane, gruelling one of which everybody else is a part. There is such fascination to it, and revealed by initiation are tantalizing bits of the paranormal. All are deceived, even those who are chosen to be the special men: scientists, engineers, educators, industrialists, politicians – big, rich, important men. The emphasis is on mysterious signs, signals, symbols, a lexicon of mysteries to be studied; a world set apart from the one outside. The good ones – the ones with proper drive, ambition, intelligence – are singled out for special treatment. The remainder, far and away the greater number – are window-dressing. Genial do-gooders, they will pay their dues, proudly wear their lodge regalia in parades, have fun at conventions. Bathed in an aura of beneficence, they will pre side at performances put on by the society for the benefit of the needy and crippled – a ploy necessary to the continued success of the operation. . . Thus, by perverse teachings are good men rendered inoperative. Like Christianity, such societies are largely holding devices. A means of insuring immobility, they are a tranquilizer providing the feeling of peace with a world at peace despite crime, drugs, disease, hunger, poverty and chaos creeping all over everything. Good cannot persevere because today Good is manipulated – manipulated so it can be surmounted by Evil. . . I had nothing to do with the situation in the world today. All I do is illuminate it with as bright a light as possible so that those with eyes to see can take heed. At the bottom of it all are the trio of gods: Zeus, Apollo and Satan, and the goddess Artemis. Working the will of these gods and goddess are the Magi, the guru, the conjurer – and charlatans who, pretending to be possessors of enormous wisdom, prey on the susceptible for the sake of a buck. Their conjuring up of spirits a sure sign they are in league with the devil himself, their dreams, and other means of divination are false, yet, strangely, they are fulfilling the revelations – the prophecies of the real Master, the Lord over all, the Messiah, Jesus Christ! According to a report found in W. B. Seabrook’s book, “Adventures in Arabia,” there is “stretched out across Asia, from northern Manchuria, through Tibet, west through Persia (Iran), and ending in Kurdistan (the place of Mt. Ararat), a chain of seven towers on isolated mountain tops. In each of these towers is a priest of Satan who, by broadcasting occult vibrations, controls the destinies of the world of evil.” One which Seabrook saw was whitewashed, fluted and cone-shaped, with a polished ball of gold, or brass, on the pinnacle, which flashes abroad when struck by the sun. Often a “Magic worker” will spend days alone in a tower. The above is a copy of a picture in my 115 year old Catholic Bible. Now called the Church of Sancta Maria ad Martyres, or La Rotonda, in the beginning it was a pantheon – a place where pagans went to worship their gods and goddesses. Built in Rome by Agrippa I in 27 B.C. (it was his son, Agrippa II who, to please the Jews, had Saint James put to death and Saint Peter imprisoned), the great arch, which is called The Rotunda, was put in place by Hadrian in A.D. 123. Circular in form, the church is 143 feet in diameter and 143 feet high (which has occult meaning). Dedicated to Mars and Jupiter (God of War, Ram or Aryan, and Jupiter, Zeus) the walls of the Rotunda are of marble. Adorned with two thick, fluted columns of yellow marble, the choir of the high altar is a semi-circle formed in the wall. The only light entering the huge edifice is received through the round opening in the ceiling. A most magnificent piece of 2000 year old architecture, when one considers that its purpose was for adoration of beings of other worlds, it is not difficult to fathom that what the rotunda really represents is the huge inside of a planet, in this case Mars. A place which, made warm and bright by a small central sun, is lush and green; a place where, amid streams of clear sparkling water and mountains high and low, the gods and goddesses make their home, safe and secure (ceiling hole depicts pole opening). It has been entirely a matter of expediency. The switch-over was so simple, so easy – like changing the name Pantheon to Church . . . . All that was necessary to get better control, better mileage and more usage out of the Gentile-Aryan was to make him or her believe that he or she was Christian instead of pagan. This was accomplished handily by the infiltration of Christianity almost at the time of inception. If only the people of my race would open their eyes, pick themselves up out of the excrement into which they’ve been driven, scrub themselves clean, stand proud and tall, flex hard the muscles, and look the enemy squarely in the eyes! Impossible of happening? While it certainly seems so at this time, it will happen. Unfortunately, only a relatively few of the actual people of God will be able to accomplish the feat. While it is true that I bring you bad news – the truth of the perilous days in which we live, and the truth of the approaching time when the air will be filled with poisonous gasses, and fire will spring up from the earth itself, when Earth will shake like a sapling in a hurricane and the peoples will be crazy with fear and suffering. I also bring you the joyful news of Zion. Yes, it is also my duty to announce to the people of my race the wonderful news of what lies ahead for those relatively few who not only will make it through the Tribulation but will do so with banners and heads held high, with exultation and a mighty strength. It is true that at this time the Great One has turned His back on us, His people. But for good reason, for now is the time of examination; now is the time for testing the will, for probing the character, for sifting, for separating the rich cream from the pale weak milk. Only the very best of His people will make it through the hell ahead. From now until the time of the Tribulation the testing and grading will go on. Then, at the time of the Tribulation He will turn again to His people – the Remnant – and gather them from wherever they have scattered, both inside and on the surface of the planet. And He will lead His remnant just as He led their very ancient forebears – the Twelve Tribes of Israel – in their flight and their fight to reach the Holy Land. It will be a second Exodus, another fight against His enemies, the enemies of the Gentile-Aryan. Like during the time of that first Exodus, the true children of Israel will again be led by the light of His spaceship. Led to places of safety, though the masses will be famished and dying of thirst, the Elect will not want for food and water. Within the bowels of Earth He will illuminate the inky blackness; He will push aside the huge boulders, and the trap doors will He break in pieces. And He will arm His elect with weapons more sophisticated, deadly and devastating than any ever devised by the trio of super-beings who work together as they pull the world apart. The inheritance of the Elect is Zion. When poison no longer contaminates the atmosphere; when the fires of nuclear war have died away; when the rest of the dead have been pulled from the rubble and buried, His people will seek and find the way to Zion, the place of the Gods, the beautiful hollow interior of Planet Earth. . . Awaiting has been an interpretation of His Holy Word. “Let the islands keep silence before me, and the nations take new strength: let them come near, and then speak: let us come near to judgment together.”. . . (the islands are planets with beings who, living on or within the orbs, are formed into nations. The heads of these nations are told by the Great One to renew their strength and their arguments, then to come near and take part in the judgment to be leveled against Planet Earth) . . . . “Who hath raised up the just one from the east, hath called him to follow him? he shall give the nations in his sight, and he shall rule over kings: he shall give them as the dust to his sword, as stubble driven by the wind to his bow.”. . . (Called Cyrus, this “ravenous bird from the east,” this “just one,” will execute the will of the Almighty One. Because he will be called of God, he will become a terror to the nations. In his armory will be weapons launched while in flight, and his targets will become places of stubble, as ashes blown about by winds of fire) . . . “He shall pursue them: he shall pass in peace: no path shall appear after his feet. Who hath wrought and done such things, calling the generations from the beginning? I the Lord, I am the first and the last.”. . . (Going forward in battle unharmed, Cyrus shall so destroy the enemy that none will chase him. The God who has been forever knew countless generations ago all that would transpire on and within this planet at the present time. In this foretelling, made thousands of years ago, He describes what will occur during the time of the coming Tribulation). . . “The islands saw it and feared; the ends of the earth were astonished: they drew near and came. Every one shall help his neighbor, and shall say to his brother: Be of good courage. The coppersmith striking with the hammer, encouraged him that forged at that time, saying: it is ready for soldering: and he strengthened it with nails, that it should not be moved.”. . . (The islands, the planets Moon, Sun, Mercury possibly Mars and Venus, will fear because of the war Cyrus will wage on Surface Earth. And so will many nations of Earth’s subworld. Confederates of the sungod and Pluto – Satan – of the world of cavern cities, they will consult with each other. To hide their alarm, they will say to each other, “There’s nothing to worry about; we’ll bring him down; we’ll put an end to the upstart.” But they will go to work in their shops to devise new and more terrible weapons of war). . . “But thou, Israel, art my servant, Jacob whom I have chosen, the seed of Abraham my friend. In whom I have taken thee from the ends of the earth, and from the remote parts thereof have called thee, and said to thee: Thou art my servant: I have chosen thee and have not cast thee away.”. . . (We, the Gentile-Aryans of the surface, are Israel. We are of the family of Abraham, Isaac and Jacob. Those who will be of the Remnant will be His servants, while Jacob, the Gentile-Aryans of the underworld, will be His chosen. From the ends of earth – entrances/exits to and out of the underworld – from the most remote areas inside Earth, He will draw Jacob, calling them to the surface. Those who understand will respond. Uniting, Jacob and Israel will fight – under Cyrus – to right the wrongs done by the enemies of the Aryan. Again, He assures us that we have NOT been forgotten by Him, not by any means! And He will call on those who are able to perceive, to discern; those who have great heart, great will, and a set determination to fight and conquer those who would destroy our race – and planet! “Fear not, thou worm Jacob and ye men of Israel, I will help thee, saith the Lord, and thy redeemer, the Holy One of Israel. Behold, I will make thee a new sharp threshing instrument having teeth: thou shaft thresh the mountains, and beat them small, and shalt make the hills as chaff.”. . . (taken from the 41st chapter of the Book of Isaiah, these last two verses are from the Protestant Bible. I chose them over the other because the wording is more thrilling, more inspiring. Here Jacob is called “worm,” indicating that Jacob is of the world beneath our feet. Here both Jacob and Israel are plainly told that He – the Great One – will be there beside them to provide for them during their times of need, to aid them during the times of battle. And here He tells of one of the instruments of war to be used by the Remnant. So awful will it be that upon launching, mountains will be torn into shreds). Many Bible students believe that Jacob, or Judah, is Germany. I’m inclined to go along with that. And I cannot but wonder if Cyrus will turn out to be Adolf Hitler. Why? Well, why, after more than 40 years since the war, does the tirade against Hitler and the German people continue unabated on television? Lies, lies, repeated over and over again, night after night. Why? The answer is FEAR! Fear that Hitler lives. Fear that he and his top men will ascend from out of Earth where they are believed to have fled at the close of hostilities, to end the war that was never officially declared ended. The Antarctic, Rainbow City – the preserve of the great champion who fought those who would destroy the purity of the Gentile-Aryan! With the first part appearing in the booklet, “UFO’s and the Dragon Power,” the following is a continuation of the manuscript, “Under Final Observation,” by Donald R. Todd. Donald’s remarkable insight into the truths lurking within Biblical mysteries is a gift to be treasured by everyone lucky enough to come in contact with his writing. What of this strange Ark of the Testimony the newly escaped Israelites were instructed to build and carry with them always? Four full Biblical chapters in Exodus are devoted to the construction, indoctrination and operation of this, to the Israelites, mysterious and all-powerful device. In order to unravel this latest enigma, there are details that need investigation. Having established the presence of spacecraft and occupants in those days, how then did the ET’s communicate? (The Lord answered Job out of the whirlwind. . . Job 38:1) Voices materializing out of the sky and clouds by some invisible entity light years away, as today’s Pastorate would still have us believe, is sheer nonsense! Any voice that may come from the sky, like any other voice, most certainly has a set of anatomically physical vocal chords behind it. Therefore, did the ET’s speak through loudhailers, public address systems, or maybe, telepathy. . .? Although the ET’s may have had such equipment and powers, certainly the humble Israelites didn’t. In order to establish convenient two-way communication, the ET’s provided the means in chapters 25 through 28 of Exodus. The “speaking device” was referred to as, the Ark of the Covenant. It could just as well have been referred to as, the Arc of the Condenser. We’ll skip over most of the dimensions and materials specified to construct it. But, let’s see what significant details we can turn up. The size: 1½ cubits wide; 1½ cubits high; 2½ cubits long. A 27 x 27 x 45 inch something. A crown of gold about the face of it. Two cherubim of gold, beaten, at either side of the “mercy seat.” The cherubims shall stretch forth their wings on high looking toward the “mercy seat.” There shall be a knop (knob) under the two branches (cherubim)… and six knops according to the six branches… Thou shalt put the mitre upon his head. In the ark thou shalt put the testimony I shall give thee. Now then. What do we appear to have? A 27 x 27 x 45 inch wooden and metal box. A gold circle on the front side. Two, long, flat things stretching out and upward, facing each other. A “mercy seat” set within the gold circle. A half-dozen knobs below the long, flat things. Some type of headset, and apparent instructions as to operating procedure. Once the instrument had been constructed inside the special tabernacle (tent) we can add the coup-de-grace. The answer becomes obvious of course. Earth’s first 27 inch, two-way television set, sure as you’re born! And apparently in color, too! And only sixty years ago, we were just diddling with crystal sets! The ET’s had finally established firm communication with their earth seedlings, and have kept in touch with us ever since in one form or another, although fundamentally, we haven’t recognized it. We’ll see the significance of such warnings a bit later. Now . . . if physical material, along with communication and marching orders were provided over a forty-year span from a consorting “cloud,” then that companion Cumulus was, for its adhesiveness and longevity alone, most remarkable! The facts seem to bear out only too clearly that what took place was, in reality, an extended Biblical airlift! We cannot leave the Israelites before pointing out a particular detail that surfaces significantly from time to time. The children of Israel encamped in the wilderness according to wherever the pillar of cloud/fire indicated. God told Moses to organize the tribes in a square camp. The twelve tribes became thirteen, because the clan Joseph split into two troupes, Ephraim and Mannaseh. Each side of three groups flew its own coat-of-arms, much like modern military forces use national insignias on their guidons. One side of three hoisted the-banner of a Man; one side waved the flag of a Lion; the third the image of an Ox; and the fourth the sign of an Eagle; with the thirteenth tribe, the Levites (priests) in the center of the square. Remember these insignia! We come now to an unfortunate incident involving the Ark of the Covenant. Another first. After a much later battle with the Philistines, in which the ET’s interceded again, David gathered the men together. The Purpose was to move the Ark from its storage building into the open, and tune it in. It was mounted on a newly constructed ox-cart. The idea was for everyone to have a parade, and a good old hoedown to thank the ET’s for their assistance in the recent battle. Generations later, during the early days of the Babylonian exile of the Israelites, the prophet Ezekiel was standing by the river Chebar. He became the recipient of a CE-III. This incident brings to mind, for explicit detail, elements of both the 1973 Pascagoula, Mississippi – Hickson/Parker – encounter, as well as a 1982 Danielson, Connecticut case that I personally investigated. (To be continued in Booklet #6, this writing of Donald Todd gives one the feeling that finally we are coming out of the darkness and into the light). In the latest publication of Cosmic Awareness (#326) there appears a letter from a woman “shocked” because of the way, over the years, CAC has recommended my literature. According to this feather-head, if you believe in maintaining the purity of the blood of your race, you support “racist beliefs,” and that is bad, bad, bad, and not according to “New Age, Golden Age,” believing. On an exchange basis, I have been receiving CAC literature for some eight years now. While I agree with some of what the publication prints, there is much that is not according to my beliefs. Primarily, I am Christian, which makes for a wide divergence in my philosophy and CAC’s. According to the feather-head, “Secrets” is garbage because she knows what is good and what is evil. . . A purveyor of “hate and fear,” “Secrets,” according to the lightweight, is not the way to “peace, harmony and universal peace.”. . . nor is it “even close to the teaching of Jesus, which is love, unconditional love.” Someone should explain the New Testament to this muddle-head. Jesus Christ was not a passivist teaching that “everyone should love everyone else.” Great Day, someone should tell the woman that Revelation, which is the book of Christ, is all about death and destruction – the final days of the world of this time. Yes, of course Christ wanted universal love. But rattlesnakes are lurking all over this world. And you don’t caress a rattlesnake without drawing back a hand filled with poison. What Christ wanted was love among His followers. And for good reason, if there wasn’t at least friendship and respect, there would have been constant bickering and friction. Now to get to the “crux of the problem with my material.” Jesus Christ was killed because He was a FIGHTER! He was killed because He let the hammer down on the people we call Jews. . . but are of the synagogue of Satan. Like His Father, who came down upon Mt. Sinai for the same reason, He too attempted to spread the truth of these people. . . That’s why they had Him killed! Taking a whip to these money-lenders, He exposed them bluntly – in a way that I never could. In exposing the Pharisee and Sadducee Jews – today’s Zionist and Communist Jews, Jesus Christ was doing exactly what I’m trying to do. . . For fear of the Jews. What a horror that is, and how it possesses the people of my race! How twisted have their minds become by what they see and hear on television, and read in books, magazines and newspapers. Now, regarding “my support of racist beliefs,” of course I’m a racist. A racist is a person who wants the integrity of his or her race to remain intact. A racist is a person who proudly guards the characteristics of his or her race. A racist is a person who wants the blood of his or her race to remain unpolluted by the blood of any other race of people. Were I black, red, green or yellow, I would be a racist. And, incidentally, most black people are racists, a fact well concealed by those who want to obliterate the Aryan as a race of people. The ploy is to lump a racist with a bigot, and thus cause the white person to feel guilt and shame for entertaining racist thoughts. Racism is a proud decent thing, while to be a bigot is to be loathsome, a mean, little person entertaining loathsome thoughts of people not of his or her color. In reply to the charges the woman made against “Secrets, the Avatar,” the publisher of CAC material (according to Webster, an avatar is the incarnation of a Hindu deity – do you reckon CAC’s publisher is really. . .?) does a sudden switch. After supporting my work for eight years, he decides to throw in with the charges made against me. Perhaps the Avatar is worried. According to him, there has been an alarming drop in subscription. Perhaps I’m being blamed for the hemorrhaging; perhaps he thinks by publicly appeasing the feather-head he can reverse the tread away from CAC. Whatever, I would like to clear up errors made in his placating reply to the woman. To begin, the publisher of CAC literature has known from the start that “Secrets” stresses Racism; that “Secrets” exposes Christianity for the fraud that it is; that I expose Zionism and Communism for the deadly systems they are – and, incidentally, the two are not the same, and you, Mr. Avatar, do your readers a terrible disservice by saying they are. From the very beginning, as you know full well, I have pulled no punches in exposing the deadly truth of Jewry. And from the beginning, you have known that I pull no punches in respect to the deadly truth of Jewry. . . and that I am totally pro-Hitler and pro-Germany. . . If you have read “Kingdoms Within Earth,” and “Secrets of the Caves,” both of which you have plugged, you are bound to know these things. One last thing. I want to make it clear that I have NEVER asked you or any other publisher to plug my books, booklets or newsletter. That is NOT my style. But I do want you to know that I have greatly appreciated your giving me a hand. It was thoughtful, and it took courage. And, oh yes, one more thing. I want to clear up an error you made. You have never written to me regarding the “Illuminati-Zionist conspiracy.” There was no need to since I never write about it. . . nor the Bilderbergers, Trilats and Rockefellers – bait stuff for the suckers. I’m sorry if some people are shocked and frightened by what I write. Why, I will never know since it points the way to survival. It seems I am faced with the same situation that confronted Jesus Christ: I am your enemy because I tell you the truth. This is a good place to bring up a very important matter: that of concerned persons attempting to bend their thinking to accommodate a host of controversial philosophies and of theories concerning who and what are responsible for the terrible times we are living in. The result of such attempts at flexibility can be traumatic, can even lead to a state of mind bordering on the catastrophic. In response to this very dangerous situation I would like to suggest that anyone attempting to learn the truth of what is going on, and finds himself or herself in a quagmire of indecision and perplexity, do the following: select from his or her fund of information the source that seems the most reliable, the most plausible, the most realistic. Take that source, expand upon it as much as possible, stick with it, and let the rest go. The following is taken from letters received from two persons in quite a bad state because of all of the controversy – the opposing literature flooding the mail these days. Dear Norma – The reason you haven’t heard from me is because my nervous system suddenly collapsed. I’ve been very ill and had to give up all my research work, which told me that it was all too much for me, and I would have to slow down and give up part of it when I recovered. During the illness and the terrible suffering, I thought it would have been better for my health were I ignorant of all the things I learned in my research, for I see all the ignorant ones around me blessed with their emotional/nervous/mental health intact. Now, I will only read certain information, such as yours, which is absolutely necessary. I have eliminated all the TV religion. Also have given up “The Spotlight” and (another which I won’t mention – ed). . . Please find a $3.50 M.O. for the booklet published after “The Fallen Watchers.”. . . Janine. What these two ladies have to say is only a bit of the confusion of subscribers that reaches me through letters and phone conversations. As for my material, I do not urge anyone to read it. I’m pleased when they do, and certainly thrilled by some of the glowing things said about my work. But I do NOT push it on anyone. I never realized when I started “Secrets” that it would turn into what it is today: A subject for study. Difficult to understand, there is nothing I can do about that except write it as plainly as possible.
. . . These people (Palestinians) absolutely refuse to accept the permanent existence of a Jewish state in the midst of what they consider to be Arab land. . . Their Bible, the Koran, their history and their traditions all impose upon them the idea that Jews as a dhimmi (inferior) people, must not be permitted to remain victors over those, the Arabs, who should rightly be their masters. The very thought that the Jews will remain a sovereign control of Israel is blasphemous.
. . . 75 percent of the Jewish children in the Diaspora do not get any Jewish education. 20 percent of the American Jewish students do not call themselves Jews anymore. We have sunk to the lowest birthrate of all nationalities, far beyond replacement level while at the same time we have risen to the heights of intermarriage in the United States. We are but one generation ahead of the degeneration of American Jewry, in spite of the unique network of Jewish day schools we have created. . . (With the assimilation of Jews by other races, in another 30 years – if the planet could hold on that long, the people of that time could grab hold of a limb and start pulling themselves out of Jewry’s sinkhole and onto firm ground – ed).
. . . Deep apprehension is growing over the influence of Pamyat, a nationalistic organization in the Soviet Union. With strong anti-Semitic tendencies, the group has received expressions of support from leading Soviet writers and has been only “mildly criticized” in the Soviet press.
. . . Followers of Pamyat are constantly complaining that the Soviet Union has too many Jewish writers and architects, and the country should get rid of them. He also stated that Pamyat leaders insist that the prime reason the Soviet Union is a nation of drunkards is because “for three centuries Jews have been selling them Vodka”.
. . . The atmosphere between Jews and blacks has been poisoned by various black ministers speeches, and by the violence of anti-Semitic acts that were the fruit of those sermons. Yet Jesse Jackson had no qualms about meeting with Louis Farrakhan, whose anti-Semitic diatribes rivaled that of the vituperative and venomous Joseph Goebbels. I am writing to thank you very much for your response to my inquiry. I have read some of the material you sent, and I think it will mike a fine addition to our Political Collection. Thanks a lot for this and the donation of the remaining booklets. In case you are ever in New Orleans, let me take the time now to invite you to pay our collection a visit. We are on the fourth floor of the library on Tulane University’s uptown campus. I’m sure you’d find many items of interest. Once again, many thanks, and I’ll look forward to seeing the other booklets in my mailbox. Like a cool, sweet breeze, the above letter from Tulane University arrived on the heels of the hot, hateful blast from CAC. This entry was posted in Uncategorized and tagged hotk, hotk ministry, norma cox, norma dorothy cox, ufo. Bookmark the permalink.